Arsenal need a win against Swansea on Tuesday night. With only eight games left to play, the Gunners are in a position where further slip-ups could ruin all the good and hard work they’ve done so far this season. Despite the occasional blips they’ve had this season, Arsene Wenger has been able to keep his side afloat in the Premier League title challenge, and now they simply cannot afford to fall at the final few hurdles. I’m not saying Arsenal should win this title to prove everyone wrong, but they’re expected to be alive in the race until the very end, or it’s arguably back to square one. It will be a huge blow for the team and the fans should Arsenal crumble under pressure now. Already questions were raised about the player’s mental fortitude while playing against big teams and overall ineptitude in handling the pressures of a title challenge, and this will reach its crescendo if Wenger lives up to the cruel moniker of ‘specialist in failure’. And to be honest, I am finding hard to see how Wenger will galvanise his team again after their 6-0 defeat against Chelsea. How will he manage to instill the belief that they’re still capable of winning the title? How will he convince the dressing room that they still can turn things around? 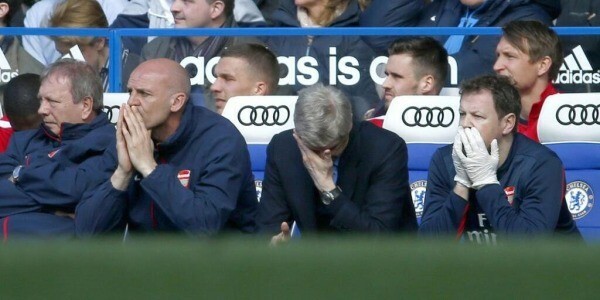 The defeat has not only put a dent in their bid for title glory, but it was a devastating psychological blow as well. Yet, as I said, they simply cannot afford to give up. Not now. Nothing is lost yet. There is still enough time to close the gap. Arsenal need to bounce back, and quickly. A strong response is needed, and that’s why the Gunners must win against Swansea. If they drop points on Tuesday night, the Gunners will not only have to kiss goodbye to their title hopes, but they may well have a fight at hand to secure the fourth place! Finishing fourth after challenging for the title until the very end is one thing, but fighting to save that spot against teams below is another. It would be a bitter pill to swallow for Arsenal fans if this does become a scrap for forth considering the generally excellent season they have had. It’s now or never for Arsenal. That’s why they need to win against Swansea and keep their hopes title hopes alive. Arsene Wenger to quit at the end of the season? its time arsenal board get behind the boss and force him if need be to sign quality players and to make sure the team has dept in all department in case of injuries……a case study of Chelsea lossing two players to red cards yet have enough replacements…..we better spend or continue to enjoy profits and kill the club…enough is enough.